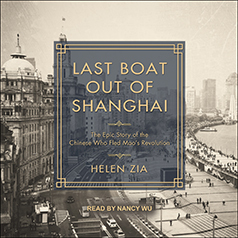 The dramatic real life stories of four young people caught up in the mass exodus of Shanghai in the wake of China's 1949 Communist revolution. Shanghai has historically been China's jewel, its richest, most modern, and westernized city. The bustling metropolis was home to sophisticated intellectuals, entrepreneurs, and a thriving middle class when Mao's proletarian revolution emerged victorious from the long civil war. Terrified of the horrors the Communists would wreak upon their lives, citizens of Shanghai who could afford to fled in every direction. Benny, who as a teenager became the unwilling heir to his father's dark wartime legacy, must decide either to escape to Hong Kong or navigate the intricacies of a newly Communist China. The resolute Annuo, forced to flee her home with her father, a defeated Nationalist official, becomes an unwelcome exile in Taiwan. The financially strapped Ho fights deportation from the U.S. in order to continue his studies while his family struggles at home. And Bing, given away by her poor parents, faces the prospect of a new life among strangers in America. The lives of these men and women are marvelously portrayed, revealing the dignity and triumph of personal survival.